The leaves are turning, the air is crisp and the dog days of summer are finally behind you. When spring sprung, you leaped into action to promote your goods. When summer sailed in, you broke a sweat to buoy your business. Now that fall is here, can you really fall back for a moment before the start of the holiday season? Of course you can, and you can get the respite you need without worrying you're neglecting work. Breaks in your activity are not just refreshing, they're required. Here's how you can catch your breath at this brief in-between time of the year and why it's so imperative that you do so. Business owners—especially the small-business champions—are in it to win it. They're working hard every day to increase their sales, buffet their revenues and build their businesses. But for the richness of their efforts and results, they might be impoverished in a very important commodity: time. Time-poor business owners are the ones who work as hard as just described, practically tirelessly. They're to be applauded for that, but they're also playing a dangerous game when they don't refresh and rejuvenate. By this time, after what has already been a 10-month stretch with no letting up (many likely forego a summer vacation), they can be ready to simply collapse—and that's beyond risky. 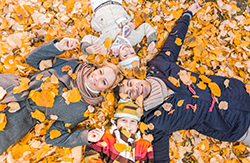 So, before that holiday season kicks into gear, take an autumn respite, and here's why. By the end of September, the die is already cast for the holiday season. Business owners either have all they need to make their best go of it, or they'll need to wait until next year. There's too little time to make big shifts in message and inventory. Presuming all preparation has been done for the coming holiday surge, now it's a waiting game for the season to get rolling. That usually happens just prior to Halloween, but it really takes off right after All Hallow's Eve. Given the previous point, there are a comfortable two weeks to gather one's self before the big show gets underway. In other words: it's break time! Let's assume you're going to take a fall furlough; good for you! Now, what will you do with your time away from business so it gives you the best results? And isn't that just like a businessperson: always thinking about "results" even when it comes to downtime? Nothing! This is what most businesspersons have the biggest difficulty doing. Try to take at least a day for just slumping into an easy chair. Turn off the computer. Turn off the phones. Turn off your mind. Relax. Spend time with family and friends. Remind yourself why you're in business, and that's usually for the benefit of you and/or those whom you care about. Spend time with them to rejuvenate your perspective of why you're working so hard. Touch base with the business, but in a limited fashion. Admittedly, no businessperson is going to completely go cold turkey on their work. Rather than pretend to, set a schedule to check calls, email, and other important matters one time a day—early or late, your choice. In this way, you can touch on urgent matters yet still get the relaxation you need. Think (but only after you first stopped thinking). If you took a day or two to do nothing, you probably cleared your mind enough to think about next steps. When you take time to de-clutter your thought process, you open the door for more creative and innovative considerations. A break lets you see things differently than you otherwise might have, had you continued your day-to-day efforts. This is where breakthrough ideas are usually born. It's one top reason for taking such a break in the first place. Energized for the big season? So how much time is enough time for an autumn break? Again, that's up to you, but many health professionals recommend at least a week, with two being preferable. Split the time up to go into brain-dead mode, then let your creative hemisphere run free for the remainder. Oftentimes, this is when you'll stumble onto solutions to matters that might have been perplexing you for the past several months. What's most important here is that you recognize that your business can surely benefit from you taking a break. Celebrate what you've achieved already this year, indulge in a bit of well-earned time off for those efforts and results, and get rested up (really rested up) for the big season to come. If you play this time right, you'll return in full force ready to make the most of the final few months of the year. So take a break. It's good for your business and it's certainly good for you, too.